Praveen Thallapally at Pacific Northwest National Laboratory's Institute for Integrated Catalysis served as a co-editor of a special edition of Catalysis Today. 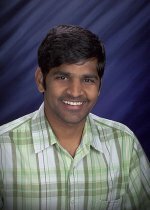 Congratulations to Praveen Thallapally at Pacific Northwest National Laboratory's Institute for Integrated Catalysis on serving as a co-editor of a special edition of Catalysis Today. The special issue focuses on turning greenhouse gas emissions into fuels. Thallapally served as guest editor with Yun Hang Hu, Michigan Technological University, and Honglai Liu, University of Science and Technology, Shanghai, China. The trio was chosen because they organized an outstanding American Chemical Society symposium titled "Greenhouse Gas Emissions: Control, Conversion and Utilization for Fuels and Energy Production." The event brought together international experts on the topic of carbon dioxide emissions. The Catalysis Today editors invited the trio to do a special issue based on the symposium. Each of the experts who presented at the symposium had the opportunity to submit a research article, which was peer reviewed. In addition, Thallapally and his colleagues requested special contributions from others who could not attend the symposium. Thallapally is best known for his fundamental and applied research on porous materials for gas separation and catalysis. He is currently conducting research into metal organic frameworks for carbon sequestration.